"I have a lot of MKV files on my Mac computer, now I'm wondering if there is any way to import MKV files to my HTC for watching them on the go. Any suggestion would be greatly appreciated." MKV is an open standard free container format similar to AVI. However, if you want to put MKV videos from Mac computer to your smartphone like HTC, Samsung, Nokia, etc for enjoyment on the move, format compatibility will stop you from doing so as almost all cell phones generally recognize 3GP format. On top of video compatibility, the file size is the other reason that you wanna compress and convert MKV to 3GP. See, we conduct a comparison test with a 94.7MB MP4 (AVC) video file. To convert MP4 (AVC) to MKV, we get a output file with 74.4 MB in size. Comparatively, the output 3GP file is much smaller in size, only 27.3 MB after converting MP4 (AVC) to 3GP. So, you can see the big gaps between MKV and 3GP codec compression ratio and file size. Of course, as for video quality, 3GP is inferior to MKV. If only video compatibility and file size are your concerns, you can begin to decode MKV video to 3GP on macOS now. 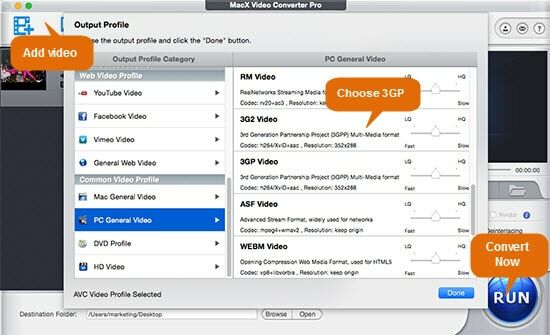 MacX Video Converter Pro - change MKV format to 3GP with 3 clicks and reduce MKV to 3GP with 60% reduction of file size. High Quality Engine, quality adjust slide bar and parameters (resolution, bit rate) adjustment can ensure you an output 3GP with 90% quality reserved! Also support to convert any video to MP4, MOV, AVI, FLV, etc. 180+ video formats. 100% Safe, no WannaCrypt Ransomware Virus. 1. Decode MKV to 3GP: with an intuitive interface, you can convert MKV media files to 3GP with 3 mouse clicks without any reference or tutorial. 2. Compress MKV: with 320+ codecs supported, this app lets you resize MKV (H265/HEVC, AVC) to 3GP (H264), dramatically downsize MKV size in codec change. 3. High Quality: Thanks to High Quality Engine, it can yield 3GP file with 80-90% quality reserved! 4. Speedy & Versatile: Intel QSV accelerated speed to convert MKV to MP4, 3GP, MOV, AVI, FLV, WMV, VOB, MPEG, etc. with 180+ video and 14+ audio formats. After free download MKV media converter for Mac and launch it, click "Add File" button and locate the MKV files which you want to convert. Select 3GP from "PC General Video". There are about 420+ preset profiles for you to choose if you have other demands like web video or Mac video format. Tips: Beyond contenting your need to convert MKV to Android, this MKV video converter for Mac also support you to import MKV to iMovie, iTunes, QuickTime, iPhone iPad and more Apple devices. Hit "RUN" to start to convert MKV to 3GP on Mac, you could view the conversion progress or cancel the converting process at anytime. If you are in a hurry to decode MKV to AVI on Mac, MacX Free MKV Video Converter provides you best solution to free transcode MKV files to AVI format with ease. Your search for a reliable way to extract subtitles from MKV will end here as this guide shares an easy MKV subtitle extraction tips for Mac and Windows and show you how to convert MKV to MP4, AVI, etc with additional srt subtitles attached. Follow the tutorial to change 3GP to MP4 with high quality and 5x faster speed than free 3GP to MP4 converter such as Handbrake and FFmpeg, and play 3GP on iPhone iPad Mac etc. without format compatibility issue. MacX Video Converter Pro is the best MKV video converter I've ever used. It can convert any MKV video to 3GP, MP4 MOV M4V, etc. no matter the H264, MPEG-4 or HEVC/H265 codec. Plus, its fast speed is quite impressive. Only 27.58 seconds and my MKV files are successfully converted to QuickTime mov format in batch.